You are at:Home»Herbs»Terminalia belerica Roxb. 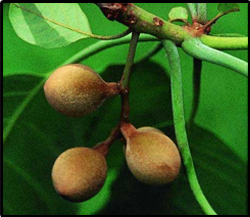 Latin name : Terminalia belerica Roxb. Description : The fruit possesses myocardial depressive activity. It is anthelmintic, antibacterial, antiseptic, astringent, digestive, expectorant, laxative, lithotriptic, rejuvenative, stomachic and tonic. It is used in coughs, bronchitis, sore throat and hoarseness. Its pulp is used in oedema, piles and diarrhoea. It is also useful in biliousness, leprosy, fever, hair care and weakness of eyesight. Recommended Dosage : 3 to 6 g powder of dried ripe fruit.